Other major airports in the region are Düsseldorf (DUS), Hannover (HAJ), Dortmund (DTM), Münster-Osnabrück (FMO) and Cologne-Bonn (CGN). 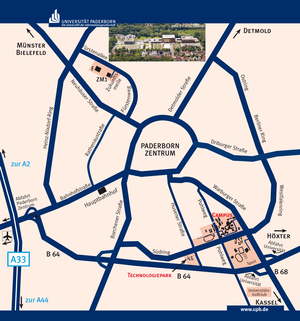 Regional trains (DUS, HAJ, CGN) or bus connections to nearest railway stations (DTM, FMO) are available all all the airports to travel to Paderborn. International travellers arriving at Frankfurt (FRA) can also travel by train to Paderborn. ICE, IC and Regional Trains arrive at the Paderborn Hbf railway station. Consult the website of the Deutsche Bahn for timetables and journey details. Paderborn is connected by Autobahn A33 which connects to Autobahn A2 and A44. From the railway station Paderborn Hbf the city buses 4, 9 and 68 (all travelling eastwards) connect to the Campus of the University of Paderborn. The bus-stops closest to the campus are "Uni/Schöne Aussicht" and "Uni/Südring". Journey details and timetables available at the website of PaderSprinter. Walking from the city centre to the campus takes about 30 Minutes. For orientation on campus please consult the Campus-Map.